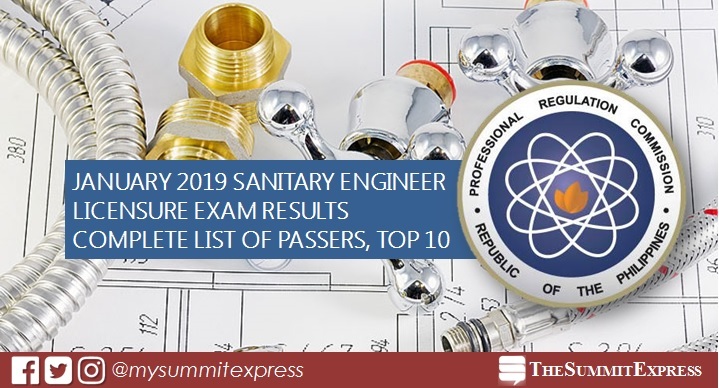 MANILA, Philippines – The January 2019 Sanitary Engineer board exam results, which include the complete list of passers, topnotchers (top 10), top performing school and performance of schools are available on this page as officially released by the Professional Regulation Commission (PRC) and the Board of Sanitary Engineering on Monday, January 21, 2019 or in two (2) working days after the exam. The first Sanitary Engineering board exam this year was administered on January 15, 16 and 17 in the city of Manila. According to PRC Resolution No. 1127-2018, the target release of the recent Sanitary Engineer board exam is on Monday, January 21 or in two (2) working days after the test. Note that results may be released on later date without prior notice. In the same period last year, results were released in two (2) working days. A total of 50 out of 96 passed the examinations. National University (NU) - Manila topped the schools with 100% passing rate or 11 examinees passed. In the January 2017 exams, results were also out in 2 working days. PRC named 62 out of 95 who successfully hurdled the series of tests. Batangas State University (BatSU) - Alangilan led the schools with 80.00% or 12 out of 15 passed.